Solgar Glucosamine Chondroitin MSM is a shellfish-free joint supplement from Solgar. 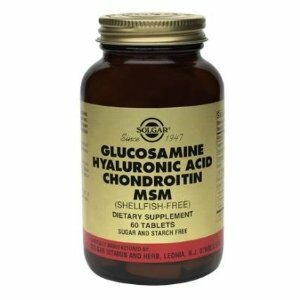 Solgar Glucosamine Hyaluronic Acid Chondroitin MSM has 4/9 ingredients we were looking for. It also has Biocell collagen. We found no artificial dyes or coloring in Solgar Glucosamine. Methylsulfonylmethane (MSM) Has 1500mg of MSM, more than most other supplements. MSM is a vital source of sulfur for protein and connective tissue synthesis. Cetyl Myristoleate (CMO) Doesn’t have CMO.Cetyl myristoleate is a compound found in the joints of arthritis-resistant mice. Curcumin Does not have curcumin Curcumin is used to reduce inflammation in Ayurvedic medicine. Hyaluronic Acid Has 30mg hyaluronic acid, an above-average amount. Hyaluronic acid is a vital fluid found in the synovial (joint-lubricating) fluid. Where does this company’s Glucosamine and Chondroitin come from since it is not shell fish? It is not listed on the label.